Carlos Estévez graduated from the “20 de Octubre” Elementary Visual Art School in 1983, the San Alejandro School of Fine Arts in 1987, and the Superior Institute of Art in 1992, all in Havana, Cuba. 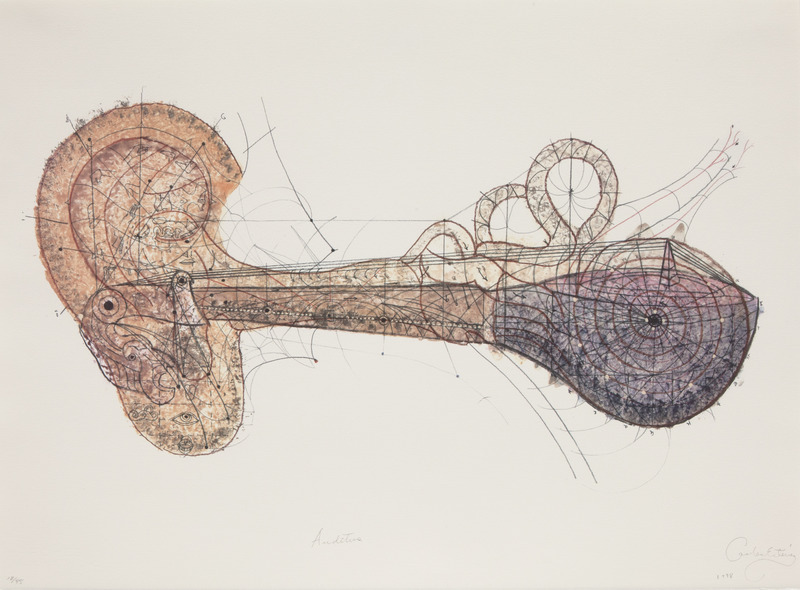 Among the most outstanding awards earned for his work are the Grand Prize of the City Salon, Havana, Cuba, 1994; the Grand Prize of the 1st Salon of Contemporary Cuban Art, Havana, 1995; and Mention at the 6th International Cuenca Biennial, Ecuador, 1998. 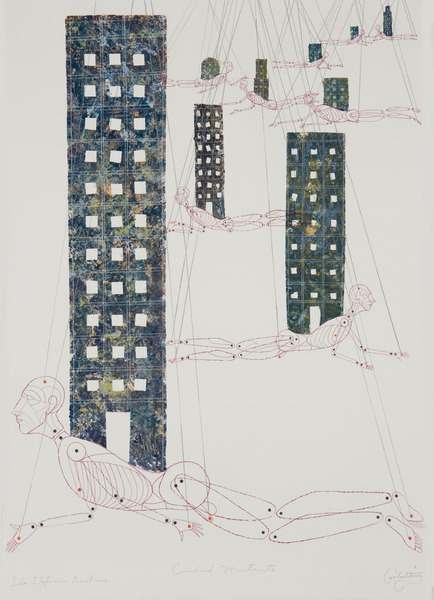 He has received scholarships, fellowships and residencies at various institutions, such as Florida International University, Miami, 2009 (Félix González-Torres Community Art Project); the Boston Art Academy, Massachusetts, 2007; the Massachusetts College of Art, Boston, Massachusetts, 2005 and 2002; Montclair State University, New Jersey, 2005; Cité Internationale des Arts, Paris, France, 2003-2004; Sacatar Foundation, Itaparica, Salvador de Bahía, Brazil, 2003; Tallix Foundry, Beacon, New York, 2001; Nordic Artists’ Centre, Dale, Norway, 2000 and 1998; Art-OMI Foundation, New York, USA, 1998; Gasworks Studios, London, United Kingdom, 1997; and Academia de San Carlos (UNAM), Mexico DF, Mexico, 1997. His works are part of the collections of the National Museum of Fine Arts in Havana; The Bronx Museum, New York; the Museum of Fine Art, Boston, Massachusetts; the Arizona State University Art Museum, Tempe, Arizona; Drammens Museum for Kunst og Kulturhistorie, Drammens, Norway; the Museum of Latin American Art, Long Beach, California; the Bacardi Art Foundation, Miami, USA; the Fort Lauderlade Art Museum, Ft. Lauderlade, Florida; the Association d’Art de La Napoule, France; and the Ludwig Forum für Internationale Kunst, Aachen, Germany, among other important institutions. Mirar a lo lejos (Look Far Away), 1998. Watercolor and pencil on paper 29 1/2 x 43 1/2 in. Tierra de nadie (No Man's Land), 2003. Colored pencil and oil on paper 39 1/4 x 27 1/4 in. 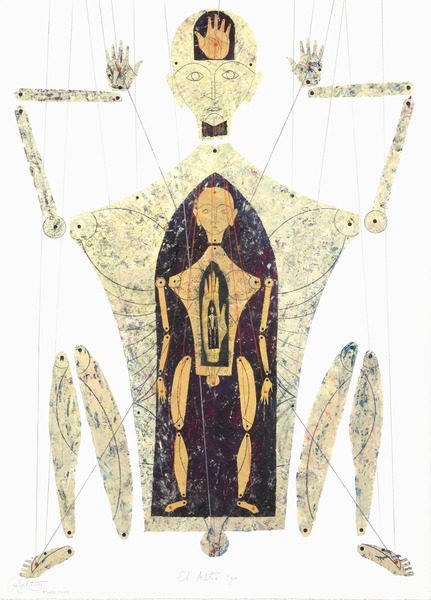 Metamorfosis (Metamorphosis), 2001. Colored pencil and acrylic on paper. 42 x 30 in. 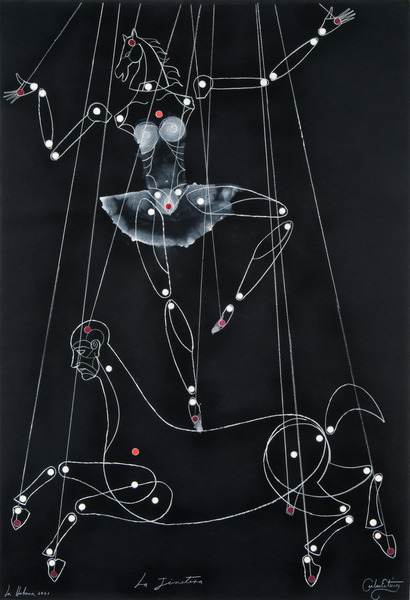 La jinetera (The Rider), 2001. Colored pencil and acrylic on paper. 44 x 30 in. 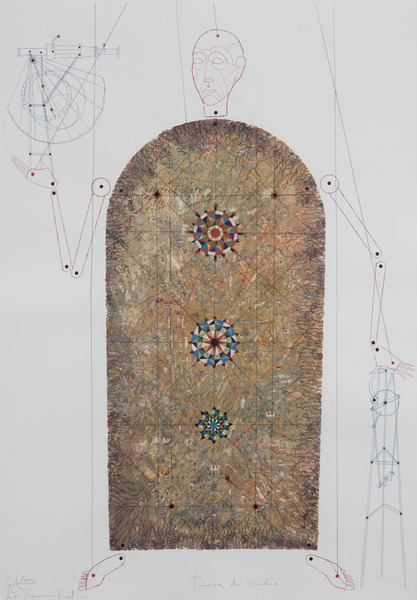 El ser y su transparencia (The Soul and its Transparency), 2002. Colored pencil and acrylic on paper. 44 x 30 in. 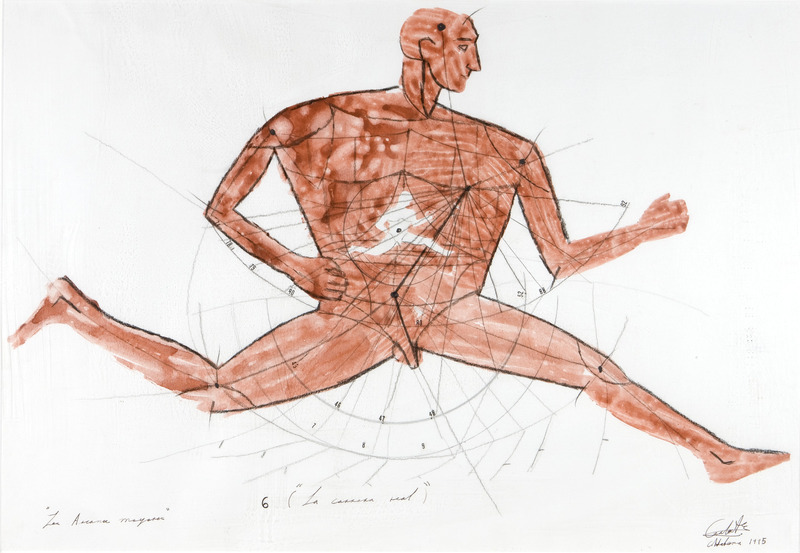 El arte de cagarse en lo que piensan los demás (The Act of Defecating on What Other People Think), 2002. Colored pencil and acrylic on paper. 41 1/4 x 29 in. Ciudad mutante (Mutant City), 2003. Colored pencil and acrylic on paper. 39 1/4 x 27 1/2 in. 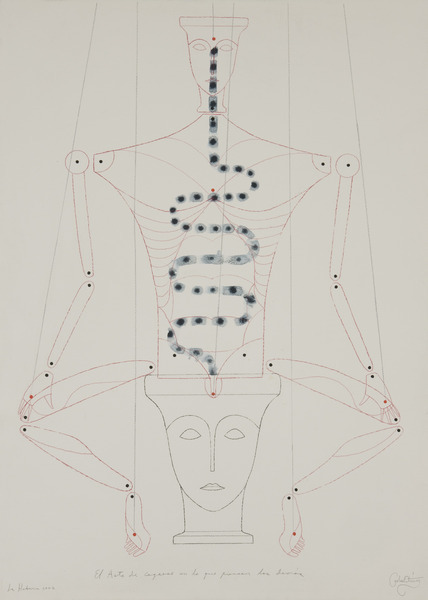 El Alter Ego (The Alter Ego), 2003. Acrylic and colored pencil on paper. 42 x 30 in. 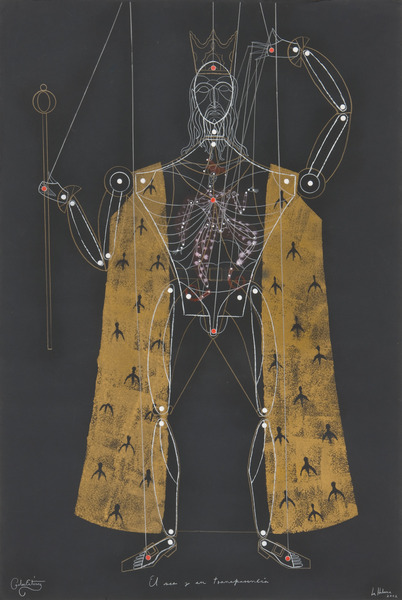 6 (La carrera real), de la serie Los arcanos mayores (6 (The Real Race), from the series The Major Arcana), 1995. Watercolor, pencil and crayon on paper. 19 x 27 in.